Ring in the New Year or toast honored guests with our 6" mini champagne flutes. They are silver and plastic which allows for elegance and easy clean-up. Our flutes are perfect for weddings, New Year's parties, birthdays, anniversary or graduations. 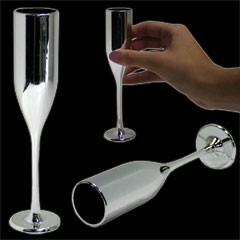 Our Silver 6" champagne flutes are sold by the dozen. Please order in increments of 1 dozen.